Let’s make our schools conducive to learning, rather than fear. Since Columbine, Sandy Hook, Marjory Stoneman Douglas, and over 200 other less publicized school shootings, school safety has understandably become an all-consuming priority in many school communities. Parents worry about whether their child is safe during the day. Educators wonder how the willingness to take a bullet or carry a gun ever became part of what it means to be a teacher, and our students practice how to hide from armed persons in regular lockdown drills. 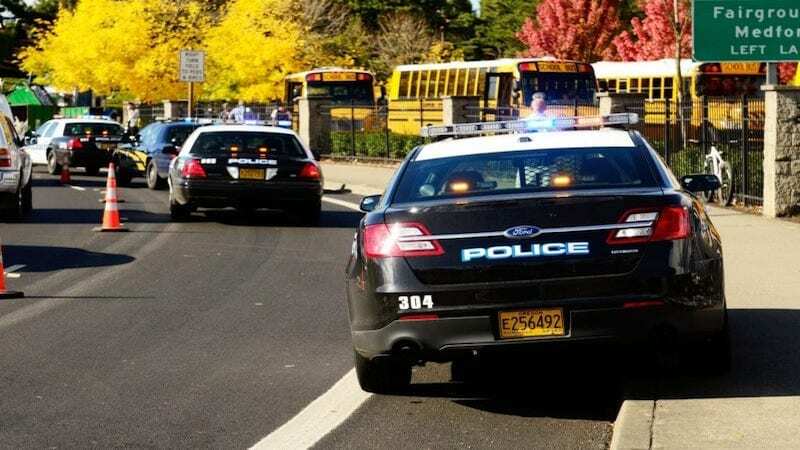 The new age of school security takes many forms—zero-tolerance policies, lockdown drills, and an increased presence of school resource officers. We face pressure from parents to prove that we can ensure their children’s safety, as well as our own. But the evidence says we’re treating the symptoms, rather than the cause. Schools with police officers reported more than triple the arrests of schools without. Only 12 states have specific training requirements to prepare SROs to work with student populations. School resource officers have repeatedly committed acts of violence against students as young as second grade. Black students make up 16 percent of the student population in the US. But 31 percent of the students who are arrested are black, often for low-level, “disruptive” offenses like dress code infractions or disrespect. Students with disabilities account for 12 percent of the student population. 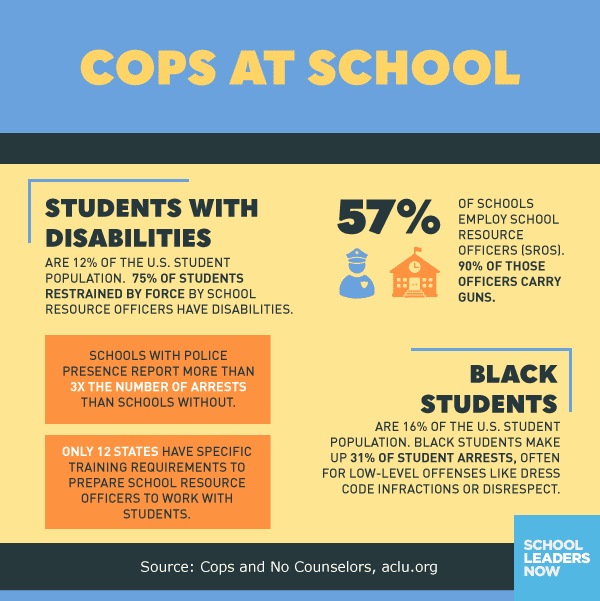 But 75 percent of those restrained by force at the hands of school resource officers are students with disabilities. Rather than caving to the pressure to appear safe, we need to analyze what is actually endangering our students. School shootings are horrifying, traumatic, and devastating … but rare. Statistically, the US experiences less than one school shooting incident per year per 100,000 public schools. The odds of a student being killed in a school shooting are less than one in a million. Still, no matter how rare, school shootings are terrifying. But there are many more pressing dangers facing our students. On average, 6.6 million children are reported as victims of abuse or neglect every year. Four to seven children die every day as a result of abuse or neglect. Yet 10 million students attend schools that have a school resource officer, but no school social worker. Among school-aged children, 3.2 percent are diagnosed with depression, and 7.1 percent have a diagnosed anxiety disorder. But six million students attend schools that have eliminated school psychologists in favor of security personnel. Even worse, suicide is the second-leading cause of death for adolescents and young adults. 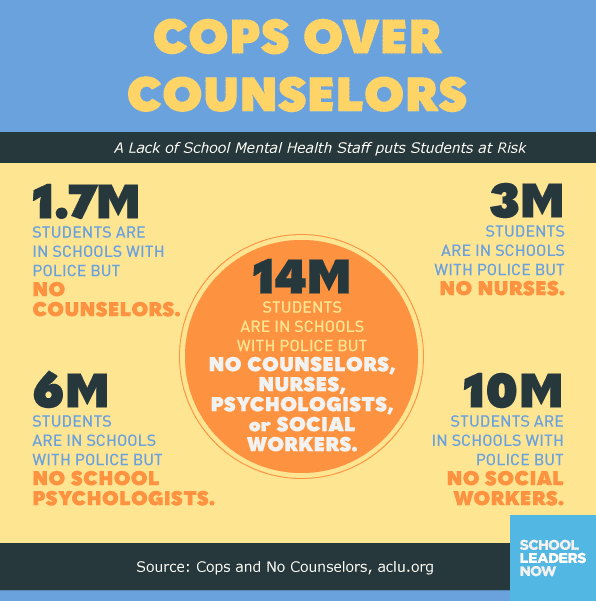 About 1.7 million students attend schools that contain cops, but no counselors. I teach seventh grade at a middle school that has 370 students. It’s an urban school. About 99 percent of students receive free or reduced lunch, and most of our students are first-generation Americans. Our students live in poor neighborhoods. And they are often surrounded by violence, drugs, and plenty of opportunities to get into trouble. In ten years at my school, I’ve seen four fights. Well, three and a half. One was staged and filmed in the girls’ bathroom in a student’s attempt to prove to her peers at other schools that our school is “hood” too. In parent, staff, and student surveys, our school invariably receives top marks for safety. Our kids not only feel safe from gun violence, they also report feeling protected against bullying, assault, and peer pressure. More importantly, they feel that teachers and administrators take a personal interest in their welfare. While we’re not perfect, we’re generally able to catch problems before they escalate into violence or bullying. And we do it without an armed school resource officer or any kind of police presence. Several teachers on different grade teams have training in suicide prevention and warning signs of depression. We share what we learn with our teams and are often able to recognize red flags before students begin acting out or self-harming. All teachers are trained to recognize signs of physical, sexual, and verbal abuse. Teams meet weekly to discuss concerns about individual students and provide early interventions. These take many forms. It could be as simple as, “Charlie’s grades have dropped in my class recently. Does anybody have a close enough relationship with him to sit down and find out what’s going on?” Or, it could be, “Jackie wrote in her journal that her dad was arrested for not having a driver’s license. We need to contact an immigration attorney to work with her family.” We maintain close ties with community resources for issues like this. We have an amazing, dedicated counselor who works with students before intervention becomes absolutely necessary. He runs weekly small groups for various populations, including students with anxiety (diagnosed or not), students coping with grief, students with parents in ICE custody, and students who self-harm. Our school has common-sense safety precautions too, of course. We know what to do if an intruder comes into the building, the doors stay locked during the day, and visitors have to show ID at the front office. Despite—or maybe due to—the absence of guns, metal detectors, handcuffs, or badges, our staff and students feel safe, welcomed, and protected. These aren’t one-size-fits-all solutions. We’re a small school, which enables us to give students more one-on-one attention. Obviously, schools with a history of violence can’t just fire all the cops and sit students down to talk about their feelings instead. But moving toward a holistic view of students’ health and safety, working to offer social services and counseling to students who are at risk, and providing students with help before they become a danger to themselves and others—these are steps any school can take. By focusing on support rather than defense, we can keep our students safe from more than just gun violence and make our schools conducive to learning, rather than fear. How is your school holistically addressing student health and safety? Share with us in our Principal Life Facebook Group. Plus, principals share how they deal with school safety concerns. The Science of Literacy Is Not a Thing, So Can We Please Stop Saying That It Is?